As the proud owner of an Ocean Rider sea horse you may be randomly selected to be one of the first hobbyist in the entire world to own a pair of seahorses with a micro coded wire tag!! This tag is so small that it does not harm the seahorse in anyway!! It is as small as the very tip of a needle making it just barely visible to the naked eye. In fact if you would like to see the code you will need to have a microscope to do so! The tag has a specific number that is etched into it and used to identify your sea horse as a genuine home grown ocean rider specimen!! This code on the tag will allow specimen to be linked up with our growing sea horse data base. This tag can only be detected with a special magnetic wand belonging to Ocean Rider. This micro tag will help to separate and identify Ocean Rider's farm raised sea horses from other specimens and wild caught sea horses. In addition, you may request that your Ocean Riders travel with their own Certification of Identity and Health for framing and keep sakes!! The Honorable Senator Daniel Inouye from Hawaii Receiving from Dr. Clyde Tamaru the first ever Certificate of Health and Identity from Ocean Rider for his pair of Fire Reds kept in his Washington D.C. aquarium along with many other farm raised OR sea horses and other marine life!! 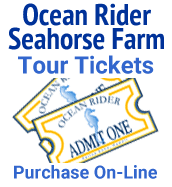 By choosing Ocean Rider farm raised sea horses and marine life you are helping to protect and preserve our precious ocean reefs and marine environment! !